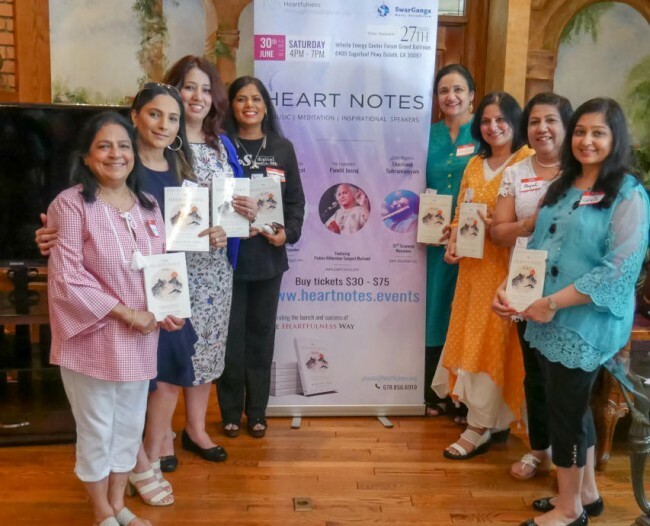 Atlanta, GA, June 13, 2018: The Atlanta Chapter of the Heartfulness Institute, a non-profit focused on meditation and wellness, and SwarGanga Music Foundation are gearing up for their first health and wellness event – Heart Notes – on June 30th, 2018 at the Infinite Energy Center, Gwinnett County. The event will bring together the legendary Indian classical musician Pandit Jasraj, popular author Chetan Bhagat and Grammy nominated flute maestro Shashank Subramanyam, to produce an evening of soul stirring music and inspiring discourse. 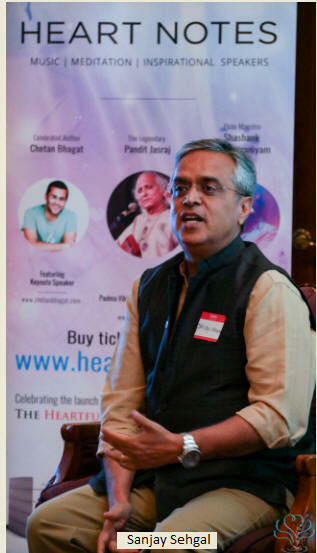 This year’s event promotes the North American book launch of ‘The Heartfulness Way: Heart-Based Meditations for Spiritual Transformation, by Heartfulness Institute’s spiritual guru Kamlesh D. Patel and Joshua Pollock. The book was earlier released in India by President Ramnath Kovind, and quickly rocketed to become a #1 best-seller there. Since its launch in North America it has already made its place in the top 5 rankings on Amazon and Barnes & Noble in the categories of meditation and spirituality. In an informal tête-à-tête with members of the community media at his Alpharetta home on June 10, Sanjay Sehgal, a long time Heartfulness practitioner, provided more information on their upcoming one-of-a-kind event. Co-Author Pollock will inspire the audience with insights from his book, and will also be signing copies of the book at the event, he said. A brief video provided an overview on the Heartfulness Institute, a non-profit global organization with thousands of certified Heartfulness volunteers in over 130 countries who offer free practices in the Heartfulness Way of meditation. Sehgal then briefly spoke about the fourth and current spiritual guide, Kamlesh D. Patel, also known as Daaji. He noted that the difference between Mindfulness and Heartfulness Mediation is simply that the former meditates on the mind whereas through Heartfulness meditation, the heart regulates the mind. 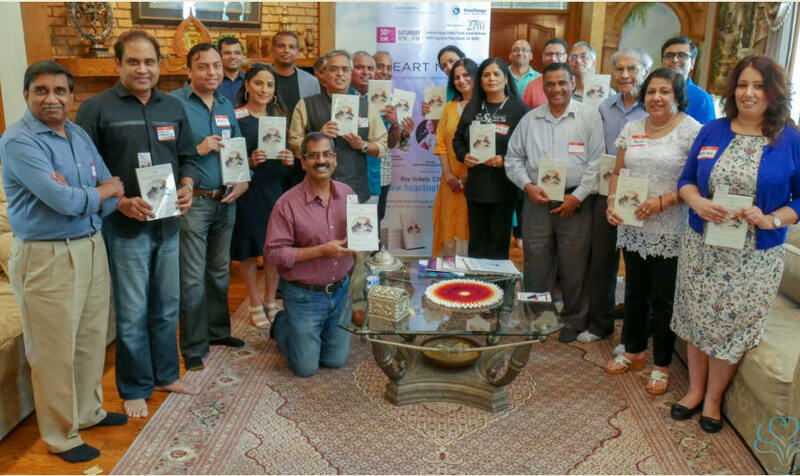 He then informed the gathering of the monthly Heartfulness magazine and the Let’s Meditate Heartfulness app. Sehgal also recounted how he was drawn into meditation as a young man of 23, and lauded the beneficial results of the Heartfulness meditation he has experienced. A complimentary copy of the book The Heartfulness Way was given to all the attendees. The Legendary Pandit Jasraj is a highly acclaimed doyen of Indian Classical Music and recipient of India’s highest civilian award for his contributions in the field of music. Chetan Bhagat is the man behind Bollywood blockbuster hits such as 3 Idiots, Kai Po Che! and 2 States, author of several other best sellers and one of India’s most sought after inspirational speakers. Noted Health & Wellness expert and host of the TV show ‘The Dr. Nandi Show’, Dr. Partha Nandi, will MC the event and weave the proceedings into a holistic wellness fabric.